There is no doubt about it - the most important things in creating a home have absolutely nothing to do with décor. That said, there are definite things one can do to give a house that homey feeling, a place with roots, warm and comfortable using décor. One of the methods I use is through using and displaying handcrafted heirlooms. I don't mean anyone's heirlooms but the treasures crafted by members of my family. These items are unique, sometimes beautiful, sometimes funky, but all have memories attached. I was exploring in Etsy the other day and I came upon a site selling handcrafted witch hazel brooms. That is what got this series rolling. I too have a witch hazel broom. It was one of many made by my Dad years ago and it graced the hearth in my childhood home for many years. It now has a home on the hearth in our family room. 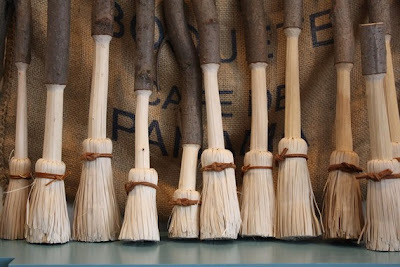 Witch Hazel brooms are hand carved from a single piece of wood. Each wood fiber is peeled back and then reversed down to create the broom. 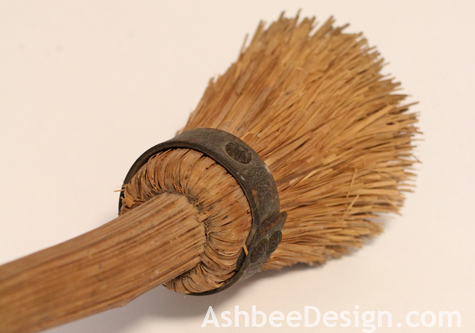 The broom end in place, curled down with a leather strap. My Dad used witch hazel but others have used yellow birch or even white oak. Follow this link for some very basic directions and information about the process of creating this type of broom. This particular broom also has a hand whittled ball trapped inside a cage at the handle end. 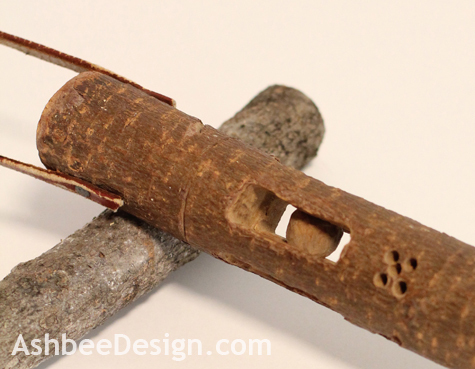 That type of whittling is always fascinating especially to children, takes time and patience. 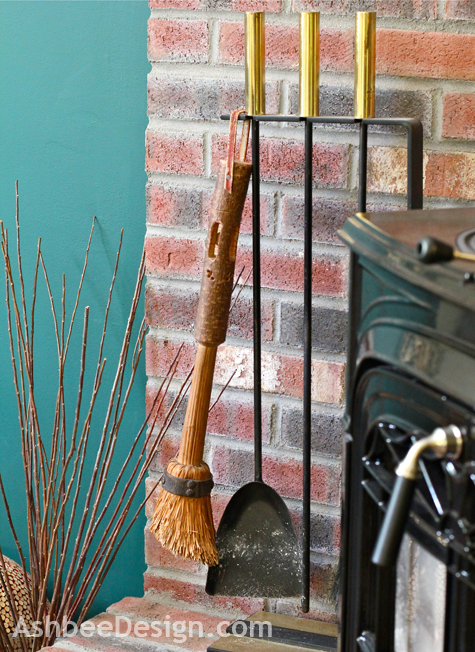 JasperJane out of Maine has the Etsy shop Out of the Woods with Witch Hazel brooms. They started my thinking about the many wonderful little things I own that are from the folks that helped inspire creativity in me. Thanks, Dad! Your creativity knows no limits... but you are right the power of a home is those tiny details that make a difference. I was blessed to have been raised in a creative home, and I am passing it on! Wow, I sure learned something today! Thanks, Marji, for the lesson. Your dad's broom really is a treasure.